Deutsche Post A.G. had a challenging year in 2018, the share price has been under pressure. In June 2018 they adjusted their earnings forecast for the group from €4,15 billion to €3,2 billion. Currently trading at a low P/E ratio, with a catalyst that could propel its revenues in the years ahead. 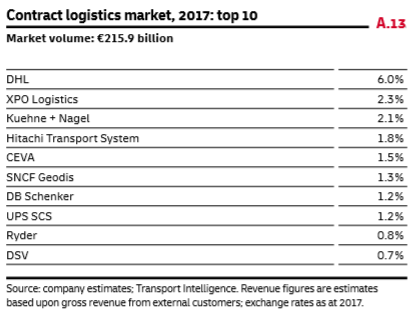 Risks in global trade presist, which could limit the growth of Deutsche Post A.G.
EBIT forecast between €3,9 and €4,3 billion in 2019 (€3.2 billion in 2018). Investment Thesis - A growing global economy equals a growing DPSTF. 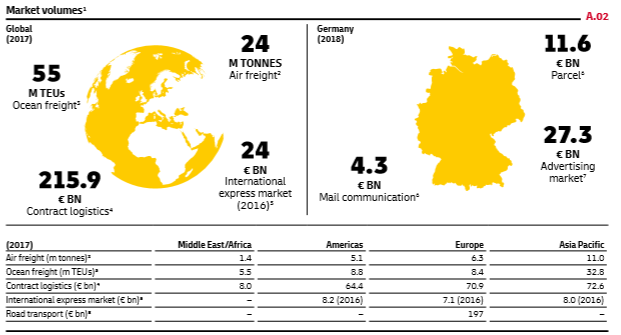 Deutsche Post A.G. with its Parcels and Express Divisions is one of the largest courier companies in the world. Booming online e-commerce will create an opportunity for DPSTF as it will lead to increased demand for courier services such as transporting documents and goods. Another opportunity besides e-commerce is global economic growth. Increased international trade and GDP growth will lead to higher demand for the services and products offered by DPSTF. In June 2018 DPSTF announced that they adjusted their earnings forecast for the group from €4,15 billion to €3,2 billion. This announcement led to a significant price drop of the share, from an all-time high of almost €40 per share in 2017 to less than €24 euro per share by the end of 2018. The PeP division has had a negative trend in earnings. In the same month DPSTF announced the adjusted earnings forecast, the board also announced plans to change the earning trend in the PeP division into a positive trend. This plan came together with significant restructuring costs. In June 2018 an additional €100 million was invested in restructuring plans. Another trigger for the sell-off was a high increase in depreciation, amortization and impairment losses. In 2018 this amounted to a write-off of €3,292 million. This write-off was attributable to a new reporting method, IFRS16. Also, staff costs increased by 3.8% as this included an expense of €400 million for an early retirement programme in the PeP division. The years ahead - Will there be sunshine? Increased global e-commerce and continued growth in emerging markets offer DPSTF significant growth opportunities. 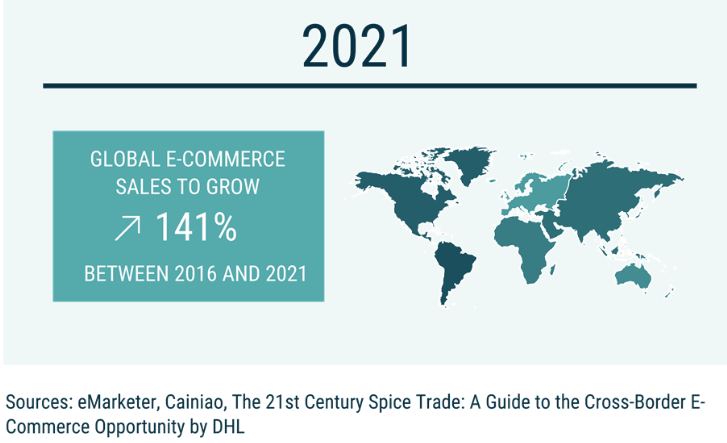 To illustrate this will take a look at global economic growth, and the expected increase in the global e-commerce market. According to the Internation Post Corporation, it is expected that global E-commerce sales will grow by 141% between 2016 and 2021. Where the Asia-Pacific market will be twice the size of that of Western-Europe and North America combined. Source: International Post Corporation, State of e-commerce: global outlook 2016-21. The World Trade bank expects the global economy to continue to grow in the coming years even though it will be at a smaller pace than expected. The largest GDP growth remains in the emerging markets and developing economies. With China expected to grow by 6.2% in 2020. According to The World Trade bank, growth in 2018 slowed more than expected. Partly due to trade policy tensions between major economies such as the European Union, China, and the United States. DPSTF specifically mentions the impact of Brexit on their operations. Mainly owing to potential changes in exchange rates, the economy, air traffic rights, and customs duties. DSPTF tries to mitigate or limit the impact of these risks, they established topic-specific working groups to prepare DPSTF as much as possible for a Brexit. The biggest cloud in front of the sun will be the PeP division. However, with the new restructuring, I believe that this cloud will pass on. By cutting costs and focusing on more automatization and efficiency I believe we will start to see a positive earnings trend coming back into this division. DPSTF also believe that growth will get back for this division in 2019. In 2018 the EBIT for this segment was €0,7 billion. For 2019 they expect an EBIT between €1.0 billion and €1.3 billion. This division deals with the transport of urgent documents and goods on time and reliably door to door. Revenue in this division increased by 7,3% to €16,147 million compared to €15,049 in the previous year. The operating cash flow from this division also increased by 25.2%. From €2,212 million in 2017 to €3,073 in 2018. This signals that operational efficiency increased and that the demand for products and services from DPSTF also increased. Investments in operational efficiency. In 2018 DPSTF signed a contract with Boing to purchase 14 new 777F aircraft. These aircraft will be more reliable and will bring greater economic efficiencies. They are expanding their transport network and modernizing it. They opened a new hub in Brussels and Madrid in 2018. For 2019 new hubs will be opened in Cologne and Barcelona. Expanded service in the Americas. Due to strong demand from the retail sector the opened 1,500 services points in the Americas in 2018. More investments will be made in Asia-Pacific. A new A330-300s aircraft will be used to better supply the markets in Malaysia, Vietnam and Hong-Kong. A new gateway was established in Zhuhai, to improve the China and Hong-Kong markets. This division deals with freight forwarding services including standardized transport as well as multi-modal transport. Due to the business model, this division is asset light. This is because they play as a broker between customers and freight carriers. In 2018 revenue in this division increased by 3.4% to €14,978 million. In the previous year, this was €14,482 million. This division saw a sharp increase in its EBIT. It increased by 48.8% in 2018, up from €291 million in 2017 to €442 million in 2018. Mainly due to improved margins in air freight and cost measures. DPSTF is the world leader in contract logistics, it has a market share of 6% globally and has operations in more than 50 countries. They offer standardized warehousing, transport and value-added services that can be combined to form customized supply chain solutions. They further strengthened their position in Latin-America with the acquisition of the Colombian Suppla Group. In 2018 revenue for this division fell by 5.7% to €13,350. This was mainly attributable to the sale of the Williams Lea Tag Group in 2017. In 2018 this division also secured €1,282 million worth of new contracts. Also here the operating cash flow improved significantly, rising from €239 million to €1,322 million in 2018. It should be noted, however, that in 2017 the operating cash flow was reduced by €459 million because of one-time fund pension obligations. Currently, the share trades at a price of €30.14 per share (10-04-2019) with an EBIT expectation for 2019 between €3.9 and € 4.2 billion euro ( €3.2 billion 2018). At the current share price and last years earnings per share ( €1,69), DPSTF currently trades at a P/E ratio of 17.8. 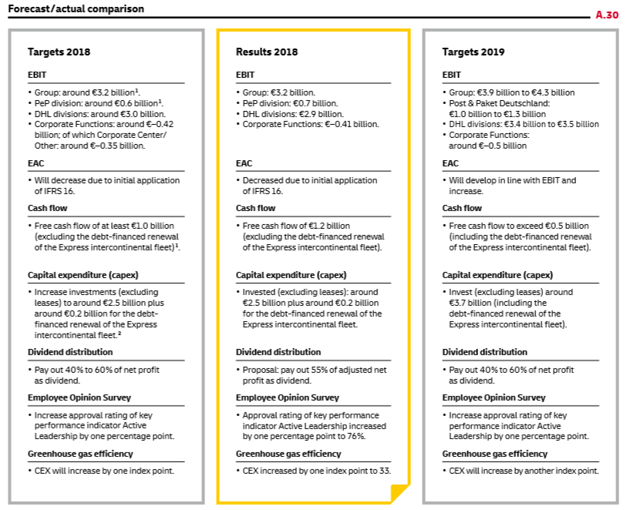 However, for this year I expect the earnings per share to be at least €2,08, based on their EBIT expectations. This will result that the share currently trades at a P/E ratio of 14.5. Below their seven-year average of 15.7. Source: Self-made table based on company data. DPSTF has a policy to pay-out between 40% and 60% of net profits as dividends. For the fiscal year 2018, they will pay out a dividend of €1,15 per share. Payable to shareholders at the Annual General Meeting on 15 May 2019. At €1,15 per share and a share price of €31 euro, the current yield is 3.81%. At €1,15 the pay-out ratio is 68.4%. If we adjust if, for one-off effects, the payout ratio is 55.4%. 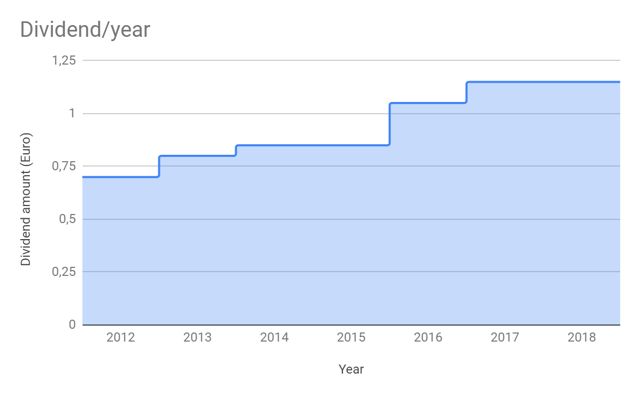 Despite having two periods of stagnating dividend growth (2014/2015 and 2017/2018) the CAGR for their dividend is 7.34% during the past 7 years. With an expected increase in EBIT and a greater focus on efficiencies, I expect that for the foreseeable future is CAGR of at least 7% should be achievable. One of the goals of DPSTF finance strategy is to maintain financial flexibility and access to low-cost capital. In order to do so, it requires to have a high credit agency rating. For DPSTF they want to maintain at least a rating of "BBB+". This target is managed by a performance metric, FFO to debt rating. Which means the ratio of Funds From Operations to debt, the higher the ratio the abler the company is to cover its debts. Despite global risks and the challenges in the PeP division, I believe that DPSTF has a bright future ahead. E-commerce business continues to grow a high pace, investments have been made to improve company efficiencies and its presence in Asia, one of the largest GDP growth areas, is well established and even growing with a new gateway in Zhuhai. Disclosure: I am/we are long DPSTF. I wrote this article myself, and it expresses my own opinions. I am not receiving compensation for it (other than from Seeking Alpha). I have no business relationship with any company whose stock is mentioned in this article.